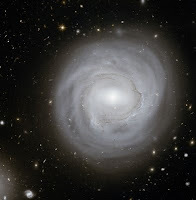 The European Space Agency just released this spectacular image of the galaxy NGC 4921 in the Coma cluster of galaxies. The detail is really jaw dropping especially considering the galaxy is over 320 million light years away. The image is actually stitched together from about 80 photos of both visible and infrared light taken by the Hubble Space Telescope. NGC 4921 is a spiral galaxy, but as you can see in the photos, its arms are clouded and indistinct. This is because of its crowded neighborhood. Galactic clusters can be volatile places, jostling and colliding galaxies into each other. 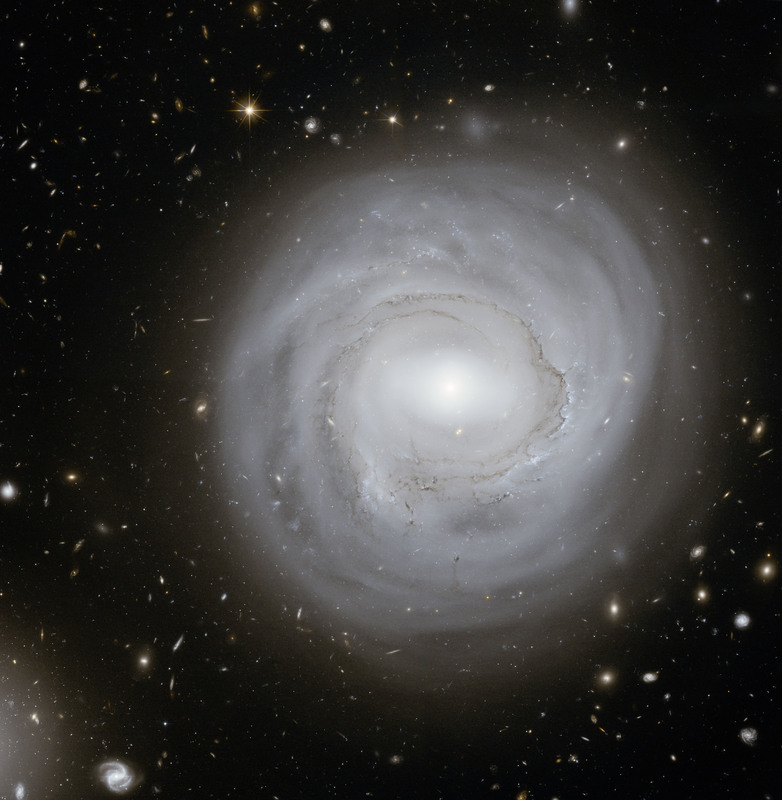 Spiral galaxies tend to have a tough time in these active environs and the fact that NGC 4921 was able to hold onto its spiral shape at all is pretty remarkable. Phil Plait at the Bad Astronomy blog has a great write up about this latest addition to Hubble's remarkable portfolio. My favorite part of the image is the dozens of other galaxies hanging out in the background. The Coma cluster is a surprisingly big and dense cluster of galaxies containing over 1000 galaxies. Located in the Coma Berenices constellation near Leo in the northern Hemisphere, the cluster contains several galaxies bright enough to be seen with an amateur telescope on a clear night. Most of the other galaxies in the cluster are football shaped elliptical galaxies. It's sometimes hard to fathom exactly how far away 320 million light years away really is. Everyone knows a light year is the distance light travels in a year, but how far is that really? Starting out, light travels at roughly 186,000 miles a second, just about the distance from the Earth to the moon in a single tick of a clock. It took the Apollo astronauts three days to make the same journey. If the Apollo astronauts left Earth and pointed their space craft at NGC 4921, the trip would take over 82 trillion years, more than six thousand times the current age of the universe. In the galactic scale of things, 320 million light years, really isn't that far away.